Wind power ... can compete with other power generation options at good sites. Wind cannot compete with the cost of producing electricity from an existing power plant that has already been depreciated and paid for by taxpayers or electricity consumers. At good windy sites, however, it is increasingly competitive with other new-build generation technologies, especially given the dramatic rise in oil and gas prices. Oil, which influences the price of gas, has increased from an average of $14 in 1998 (in real terms) to around $100 in 2008. The current cost of producing electricity from wind energy ranges from approximately 6 to 8 €cents/kWh at sites with low to medium average wind speeds down to 4 to 5 €cents/kWh at good coastal sites. The power utility Hydro-Québec in Canada, for example, has agreed contracts with wind developers to install a total of 1,000 MW of wind power in the period 2006-12 at an average tariff of 4.08 €cents/kWh over a 20 year lifetime. 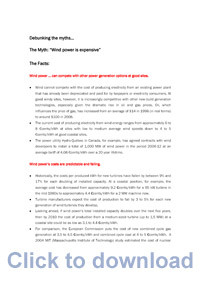 Wind power’s costs are predictable and falling. Historically, the costs per produced kWh for new turbines have fallen by between 9 and 17 for each doubling of installed capacity. At a coastal position, for example, the average cost has decreased from approximately 9.2 €cents/kWh for a 95 kW turbine in the mid-1980s to approximately 4.4 €cents/kWh for a 2 MW machine now. Turbine manufacturers expect the cost of production to fall by 3 to 5 for each new generation of wind turbines they develop. Looking ahead, if wind power’s total installed capacity doubles over the next five years, then by 2010 the cost of production from a medium-sized turbine (up to 1,5 MW) at a coastal site could be as low as 3.1 to 4.4 €cents/kWh. For comparison, the European Commission puts the cost of new combined cycle gas generation at 3.5 to 4.5 €cents/kWh and combined cycle coal at 4 to 5 €cents/kWh. A 2004 MIT (Massachusetts Institute of Technology) study estimated the cost of nuclear generation at 5.1 €cents/kWh. Wind power … would be even more economic if it operated on a level playing field. If the “external” costs of damage to health and other environmental effects of different fuels are added in, the European Commission Extern.E project has concluded that the cost of coal-fired generation would double and the cost of gas-fired generation increase by 30. A recent study by Emerging Energy Research for turbine manufacturer Vestas concludes that if a cost of €30 per tonne of CO2 was applied to emissions from fossil fuel power stations, onshore wind energy would be the cheapest source of new power generation in Europe. One of the most important economic benefits of wind power is that it reduces countries’ and power producers’ exposure to fuel price volatility. This risk reduction is presently not accounted for by the standard methods of comparing electricity costs, which have been used by public authorities, including the International Energy Agency and the European Commission, for more than a century. Wind power has a light footprint. Its operation does not produce harmful emissions or any hazardous waste. It does not deplete natural resources in the way that fossil fuels do, nor does it cause environmental damage through resource extraction, transport and waste management. In a wind farm the turbines themselves take up less than 1 of the land area. Once up and running, existing activities such as agriculture and hiking can continue around them. Farm animals such as cows and sheep are not disturbed. Any impacts on the local environment (see below) must be set against the much more serious effects of not developing renewable energy sources and thereby aggravating the pressures of climate change on the balance of nature. Wind farm developers are required to undertake an Environmental Impact Assessment to ensure that their potential effect on the immediate surroundings, including fauna and flora, are carefully considered before construction is allowed to start. They also work closely with conservation and wildlife groups to ensure that new developments are sympathetic to existing habitats. In many cases impacts can be avoided or reduced by adjusting the location of the whole project, the number of turbines or re-siting individual turbines. Wind power’s overall impact on birds, bats, other wildlife and natural habitats is highly site specific. In addition, impacts from wind power are extremely low compared with other human-related activities. Deaths from birds flying into wind turbines represent a small fraction of those caused by other human-related sources such as cats and buildings. US statistics show 1 billion birds are killed by colliding with buildings each year and up to 80 million by vehicles. By comparison, it’s estimated that commercial wind turbines in the US cause the direct deaths of only 0.01 - 0.02 of all of the birds killed annually by collisions with man-made structures and activities. In Europe, a 2003 study in the Spanish province of Navarra - where 692 turbines were then operating in 18 wind farms - found that the annual mortality rate of medium and large birds was just 0.13 per turbine. Despite this minimal impact, extensive efforts are made to avoid siting wind farms in areas which might attract large numbers of birds or bats, such as migration routes. Avian studies are routinely conducted at wind sites before projects are proposed, and any changes monitored afterwards. With careful siting and strategic planning, the most sensitive areas can be avoided and wind development can proceed quickly. At a distance of 300 metres, a modern wind turbine is no noisier than a kitchen refrigerator or a moderately quiet room. Improved design has drastically reduced the noise of mechanical components so that the most audible sound is that of the wind interacting with the rotor blade. This is similar to a light swishing sound, and much quieter than other types of modern-day equipment. Even in generally quiet rural areas, the sound of the blowing wind is often louder than the turbines. To avoid potential disturbance to neighbours, strict rules are applied by local authorities to ensure that wind turbines are located at an agreed distance from nearby houses. Wind farms developers have to take into consideration the potential landscape and visual impact when selecting a site. Visual simulations are produced and discussions held with the local community. The generation of electricity by wind turbines is dependent on the strength of the wind at any given moment. It is therefore variable, but not unpredictable. Wind farm sites are chosen after careful analysis (usually by on site anemometer masts) to determine the pattern of the wind “regime”, including its relative strength and direction at different times of the day and year. This enables a forecast of likely output to be made, information which can be made available to the network operators who will distribute the electricity. Wind forecasting has improved enormously in recent years, partly based on better weather predictions by meteorologists. The closer to real time a forecast is made, the more accurate it will be. Because of the way the electricity network is planned, there is no need to back up every megawatt of wind energy with a megawatt of fossil fuel or other power. All networks have enough spare capacity available to deal with disconnections, breakdowns and sudden surges in demand. No power plant is 100 reliable. The network is designed to absorb many impacts, from electricity generation sources going out of service unexpectedly to industrial customers starting up energy intensive equipment. The grid operator constantly matches the electricity generation available to electricity demand, and wind energy’s variability is just one more variable in the mix. At the current relatively small level of wind power in most countries, variations in the output from wind farms are barely noticeable over and above the normal fluctuation in supply and demand. There is therefore no need for additional back-up because of wind energy. No serious attempt has been made to quantify the cost of back-up needed when installing other generating technologies. A 2006 study by the UK Energy Research Centre concluded that the output from fossil fuel power stations will need to be adjusted to cope with fluctuations in wind power output, but this adjustment would be small and would have no significant effect on wind’s contribution to CO2 savings. If wind power were to supply 20 of the UK’s electricity, the study concluded, the cost to electricity consumers of handling its intermittency would be 0.1p (€0.15)/kWh. In Denmark, approximately 20 of electricity demand is already supplied by the wind, and is managed successfully by the Transmission System Operator. In the past, no electricity generating technology has been developed, introduced and become competitive without initial support. One reason is that many local or national governments either wholly or partially owned energy companies. This state backing has not been clearly documented, so it is not easy to accurately assess the financial support for well-established industries such as oil, natural gas and nuclear power during their development phase. In 2004, the European Environment Agency assessed direct and indirect energy subsidies by EU member states and the EU Institutions across the EU 15. The report estimated that total subsidies in 2001 were €29.2 billion, of which €23.9 billion was for fossil fuels and nuclear and €5.3 billion for renewables. The fossil fuel sector - coal, oil and gas - receives three-quarters of all energy subsidies, primarily through the direct state aid given to the coal sector and preferential tax rates for gas and oil exploration. These financial incentives include tax deductions, loan guarantees, liability insurance and support for research and development. In Germany, coal mining absorbs almost 30 of all subsidies for trade and industry, receiving about €100 billion since 1980. Worldwide, according to the United Nations, conventional energy sources receive n estimated $250-300 billion in subsidies per year. In the United States, or example, the federal government as paid out $35 billion over 30 years to cover the medical expenses of miners suffering from “black lung disease”. Such distortions mean that the true cost of “conventional” energy sources is not reflected in their market price. The present situation is that environmentally harmful practices are accepted, and indeed often subsidised, and there are few taxes that fully reflect the “external costs” of electricity production (effects on environment, health etc). Without mechanisms to internalize these external costs, a second best solution to a level playing fi eld in the electricity markets is for member states (and potentially the EU) to enable adequate incentives to increase the proportion of renewable energy. Incentive mechanisms should be viewed as compensation for the lack of internalization of external costs in power production. Electricity generated by renewables replaces electricity generated by conventional fossil sources. The benefits are the damages that are avoided. Clean, renewable wind energy produces no emissions, requires no fuel and its cost is fixed and predictable over time. According to the European Commission’s Extern-E project, the cost of producing electricity from coal would double, and that from gas increase by 30, if external costs in the form of damage to the environment and health were taken into account. The study further estimated that these external costs amounted to 1-2 of EU GDP, or between €85 billion and €170 billion, not including the cost of global warming and climate change. The main purpose of the wide range of economic measures to support renewable energy technologies is to provide incentives for technological improvements, increased renewables capacity and cost reductions. This will ensure that we have cheap, clean technologies available in the future as competitive alternatives to conventional power sources. Economic incentives are also an important tool for encouraging new businesses and investment. In most countries the payment system is designed so that incentives decrease in value as wind power becomes more economically viable.